Snap it closed. Organized beauty. Keep treasures safe, compact and ever-sophisticated. You'll never forget your hard-case travel companion swathed in vegan leather and loaded with elegant features. Snap it open. Admire fine embossed details and feel an elegant plush interior. Discover enough different ways to stow your earrings, necklaces, bracelets, pendants, anklets...to make Cleopatra jealous. This jewelry organizer will keep you from losing your treasures while letting you focus on traveling from one exotic locale to the next (or making one boring airport to the next your personal fashion runway; if that's your thing). Great for international travel to top destinations like Rio de Janiero, Brazil, France, Spain, China, Italy and many others. 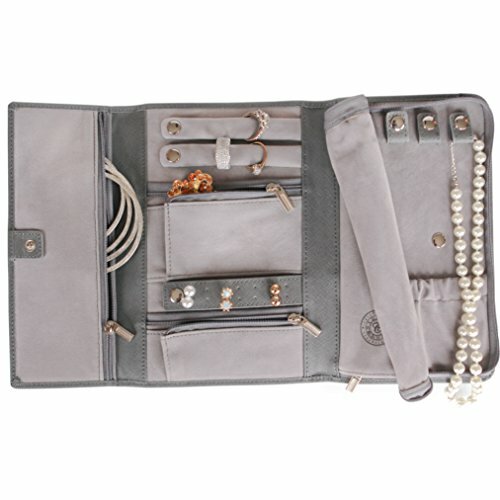 This organizer is perfect for small form jewelry but may not be appropriate for larger statement pieces. ✅ Luxurious GREY comes with SAFFIANO LEATHER. This genuine leather is coated in a protective layer with a cross-hatch pattern. This not only makes the leather more beautiful, but also more durable. If you have any questions about this product by case Elegance, contact us by completing and submitting the form below. If you are looking for a specif part number, please include it with your message.